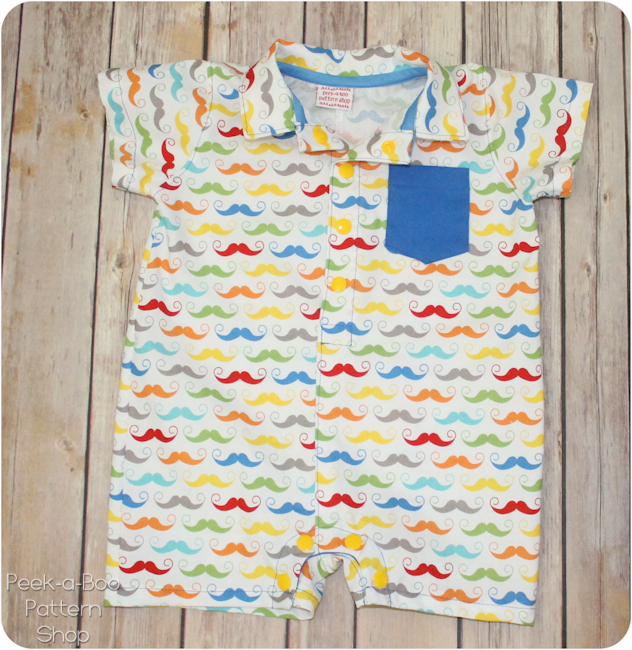 Button-Up Baby Romper FREE Pattern! 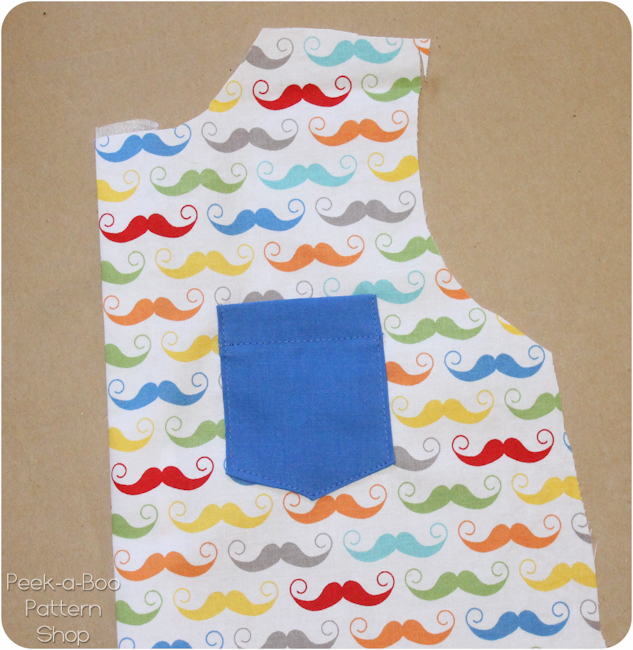 Today I have a FREE baby romper pattern to share with you! 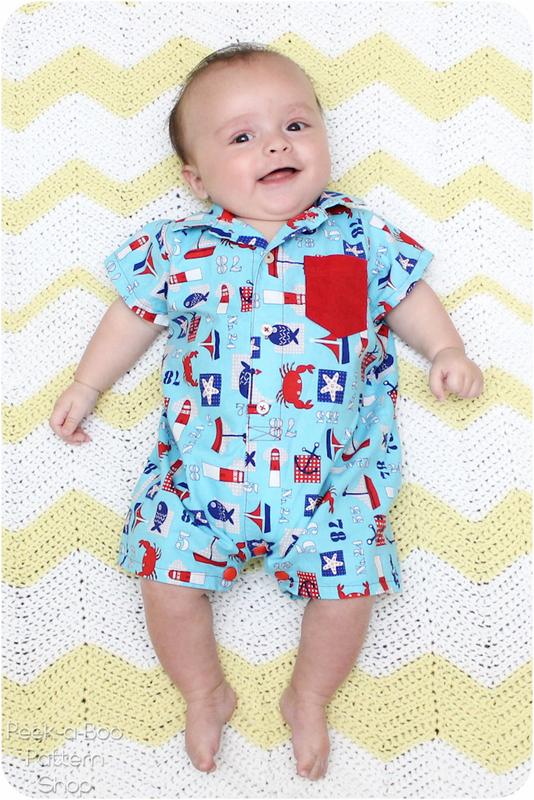 This button-up baby romper pattern is Levi’s outfit for the 4th of July this year and it coordinates with Will’s shirt that I shared last week. I love rompers on babies! 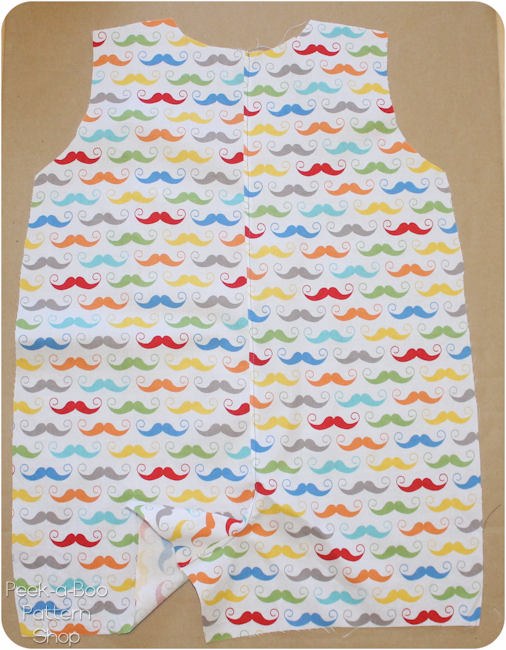 Does a baby in your life need a dapper little romper? I’m giving this one away! 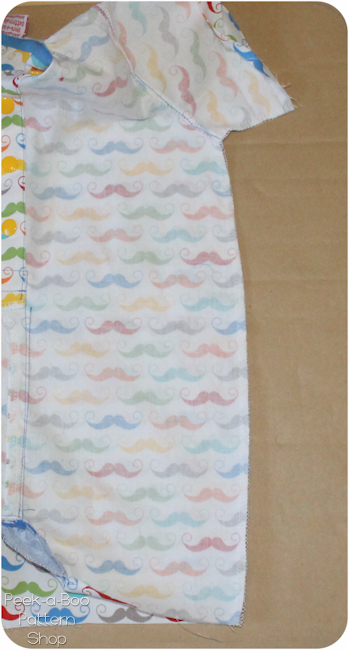 It’s also a size 6 months and sewn up with lots of love 🙂 Come join the Peek-a-Boo Facebook Group for your chance to win it! Just find the photo and comment for your chance to win! Now let’s sew up a romper! 1. 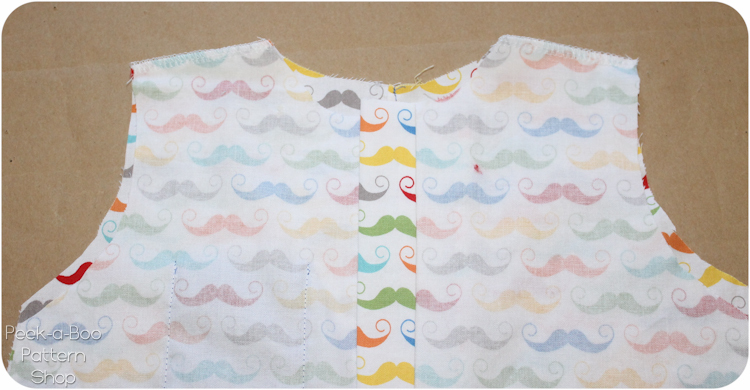 Add a 1″ strip of interfacing to each front romper piece 1/4″ in from the placket edge. Your placket is the portion up at the top. 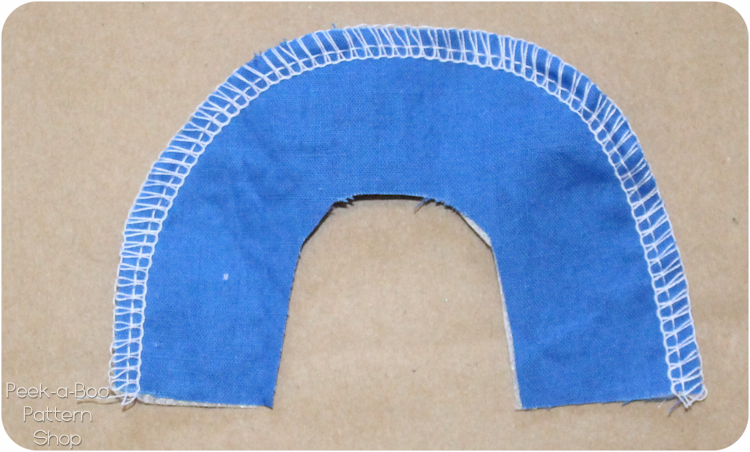 Finish the center front seam/bottom edge of the placket with a serger or zig-zag stitch. While you have your interfacing out add a piece of interfacing to the front snap placket, 1 back snap placket and 1 collar piece. 4. Press the top edge of the pocket over 1/4″ towards the wrong side. 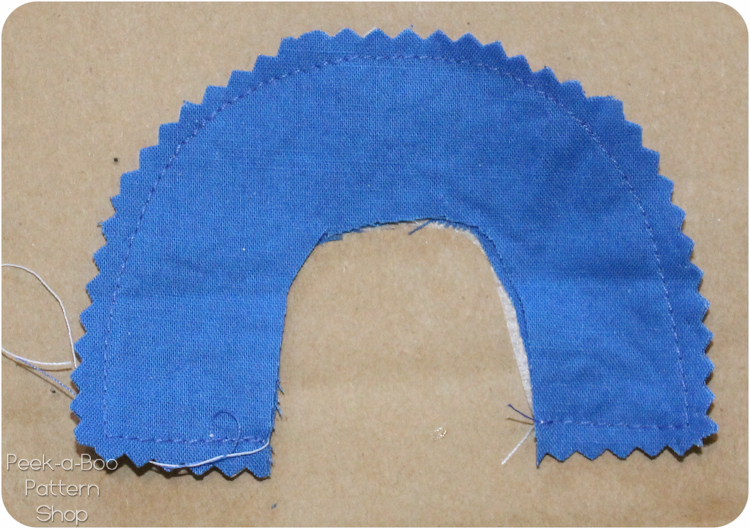 Press the top edge over 1/2″ towards the right side and topstitch the folds in place 1/2″ in from the sides. 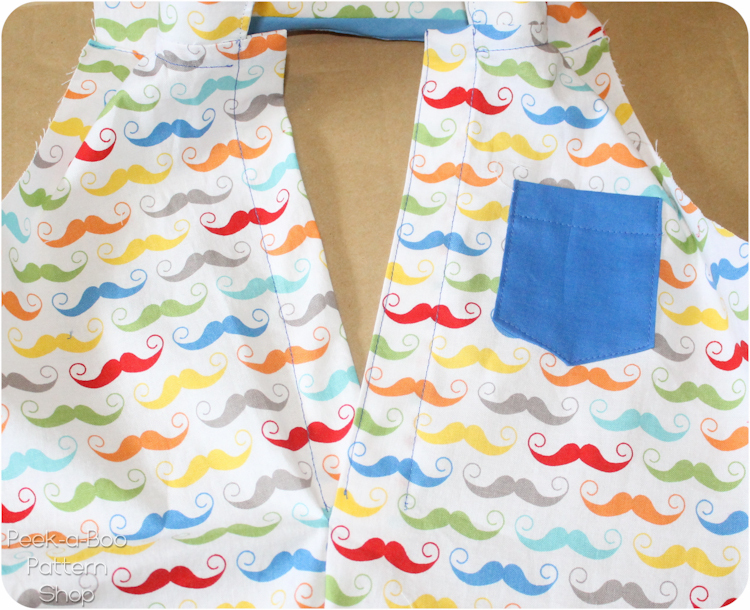 Turn the top of the pocket right side out and press the sides and bottom edges in 1/2″. Topstitch the top of the pocket. 6. 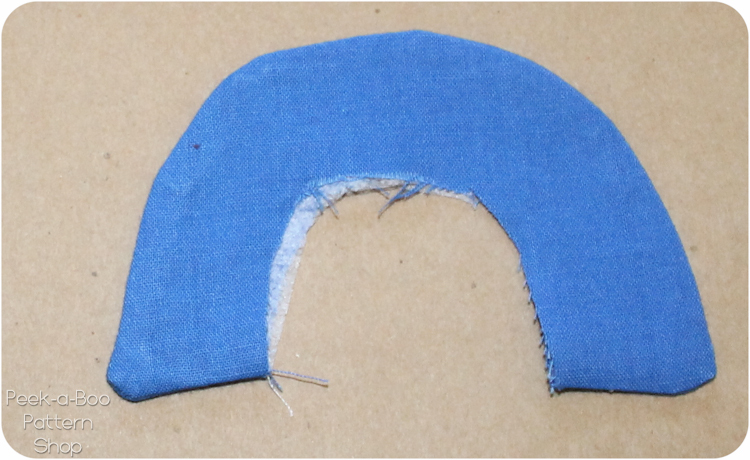 With right sides together (RST) sew the 2 back pieces together along the center back seam/back rise. 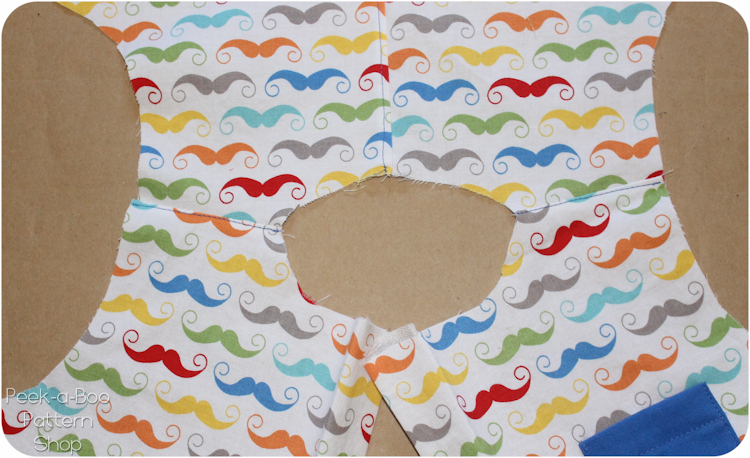 If you’d like you can topstitch the seam allowance to either side of the back piece. 8. With the back placket on the right side of the fabric sew the raw edge of the placket to the back inseam using a 1/4″ seam allowance. 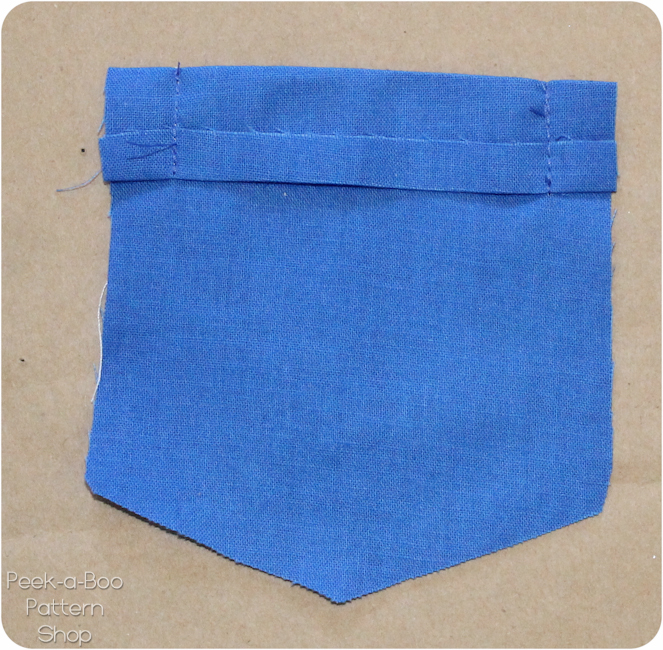 The placket will end 3/4″ before the raw edge of the romper (this leaves room for the hem). 10. With RST sew the left and right front pieces to the back at the shoulder seams. 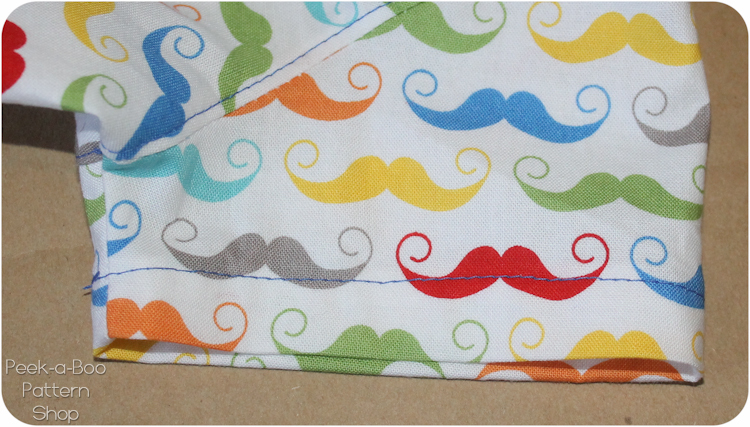 If you’d like you can topstitch this seam allowance to the front of the romper. 11. 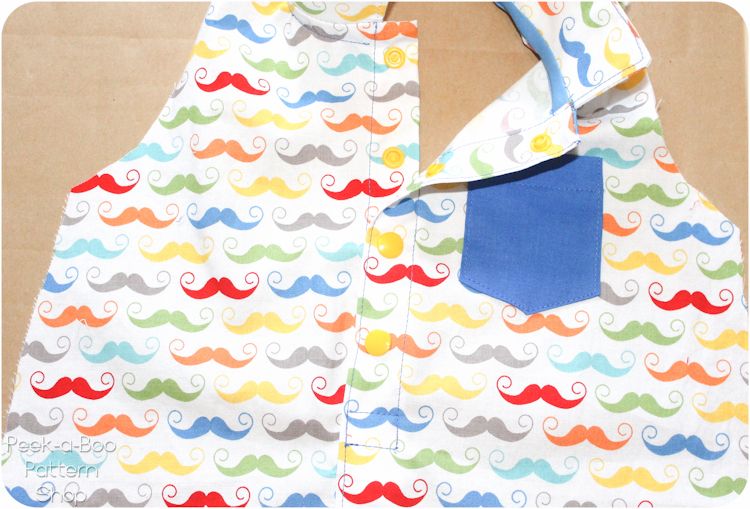 Center the collar on the neckline and sew in place with a 1/4″ seam allowance. Your placket should be unfolded during this next series of steps. 13. Unfold your bias tape. 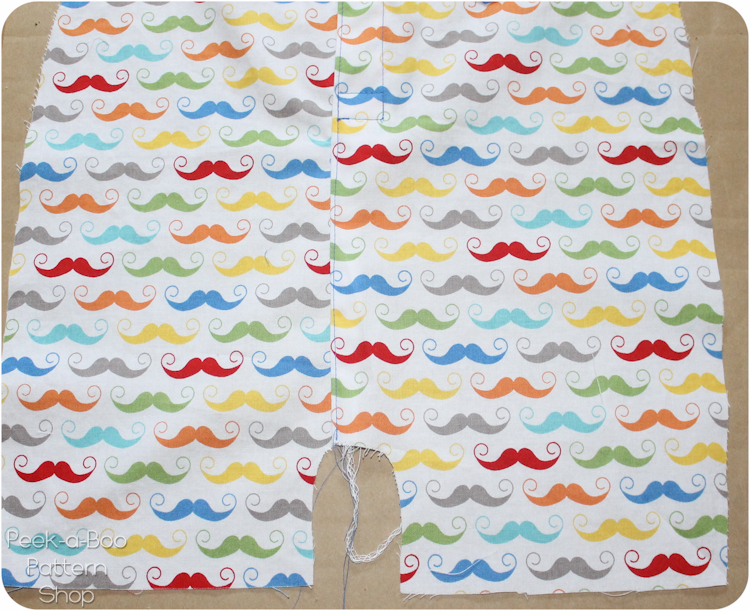 With RST sew along the fold line in the bias tape right on top of your stitching line from step 11. 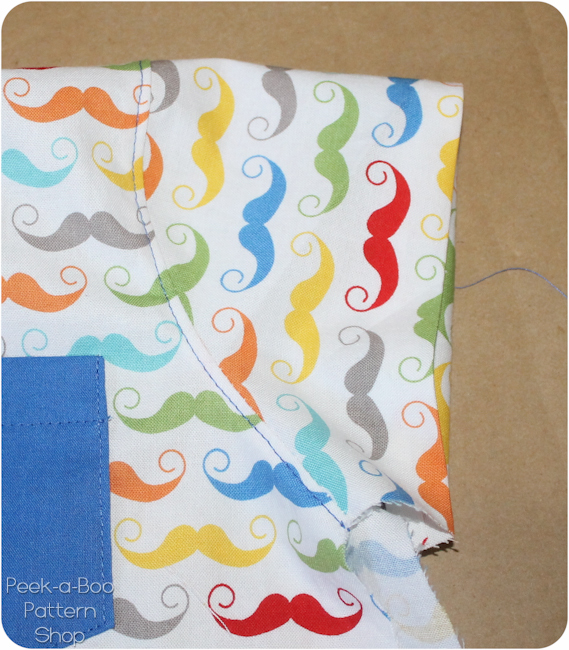 Make a series of little snips into the seam allowance so it lays well in the next step. 16. Refold the placket pieces and press flat. Topstitch each side of the placket (you will need to move things out of the way a bit as you sew). 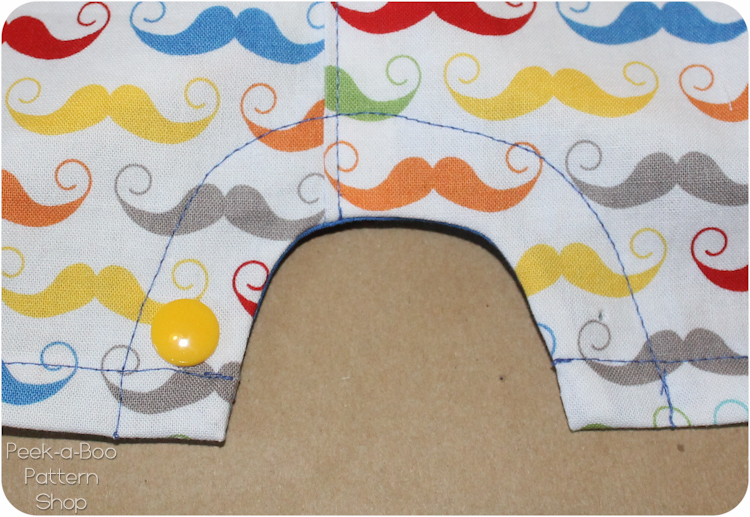 On the left front piece (or right if you’re sewing for a girl) add a line of topstitching along the center front edge. 17. 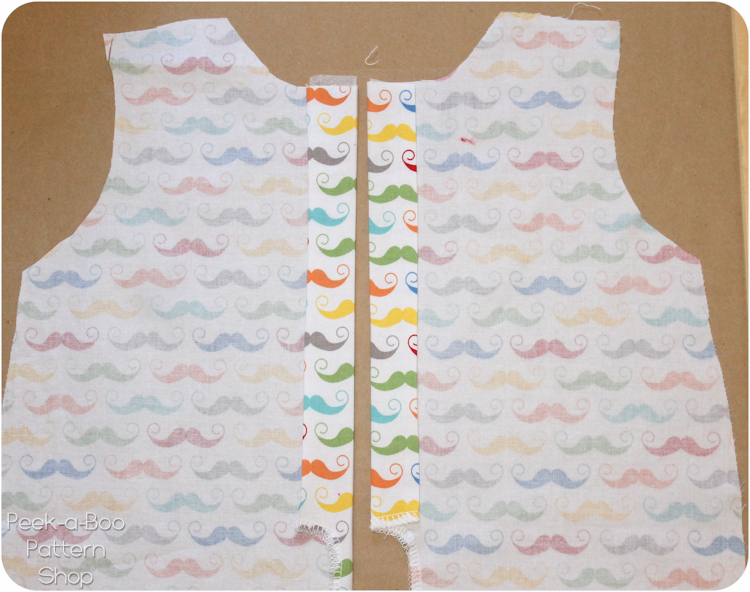 Overlap the placket pieces so everything is laying flat. Starting at the crotch topstitch along the center front seam up to where you left off in the previous step. Sew over to the far stitching line, turn and go down 1/2″ and then back to the center front line to secure the bottom edges of the placket pieces. 20. 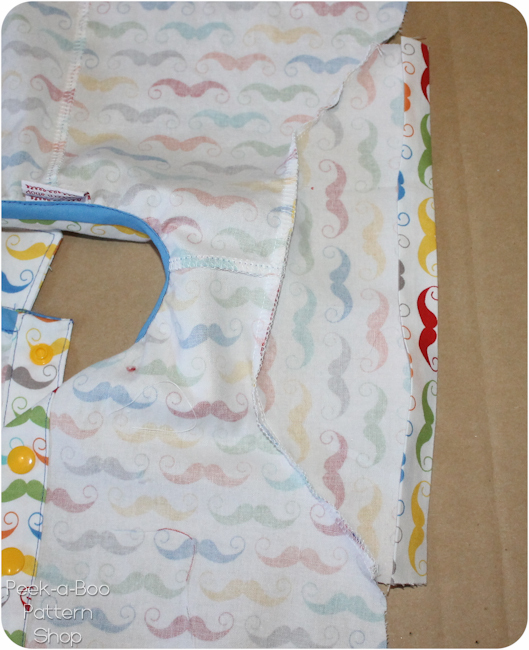 With RST sew the front snap placket piece to the front romper using a 1/4″ seam allowance. It will end before the bottom edge of the romper. 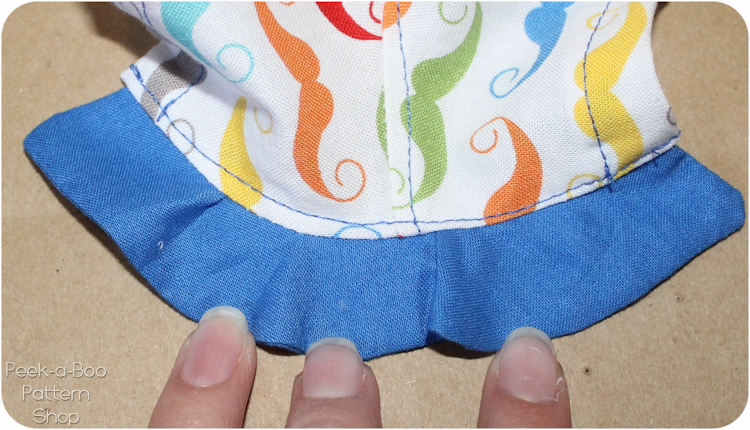 Keep in mind that your “center front” seam is actually off to one side by 1/2″. 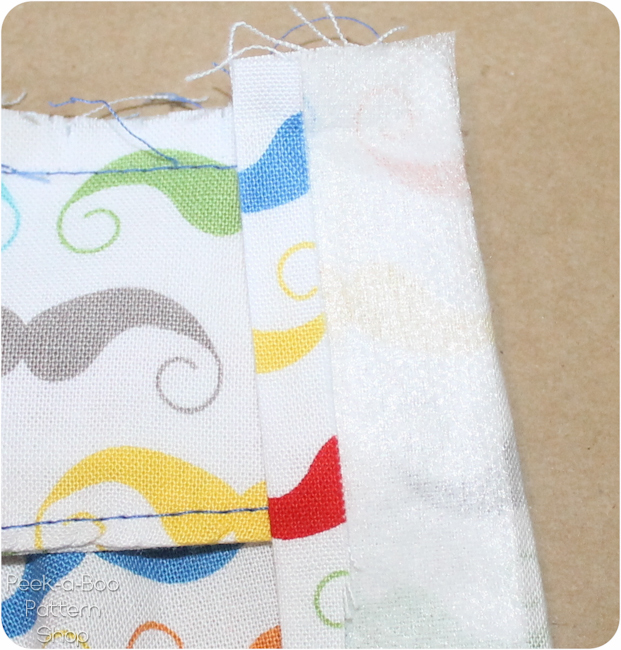 Clip along your seam allowance. 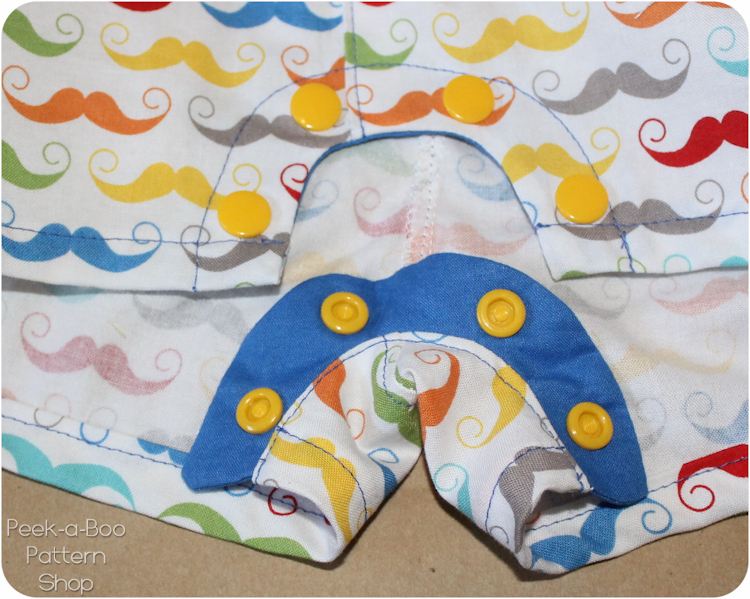 Flip to the inside of the romper and topstitch in place along the seam and along the outside edge to keep it in place. 21. With RST sew the sleeves into the armholes. If you want you can topstitch the seam allowance to the body of the romper. 22. With RST sew up the sleeve inseam and romper side seam. You will need to unfold the sleeve hem while you sew this step. 23. Refold the pressed lines of your sleeve and hem. 24. 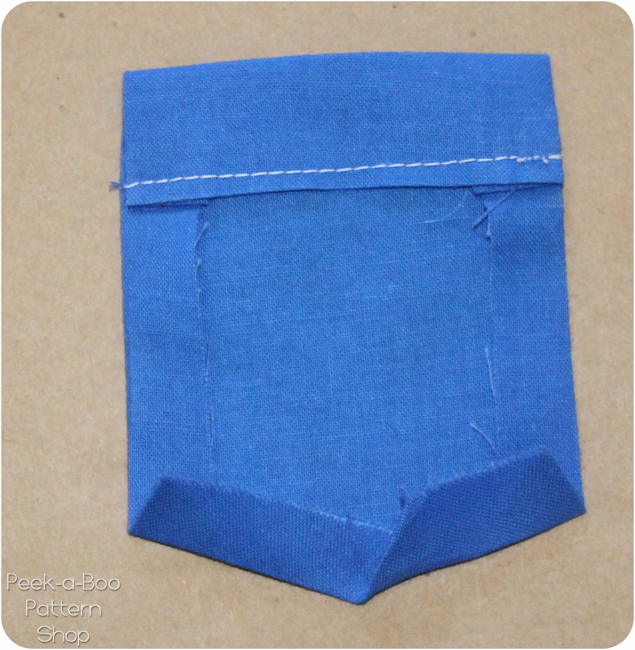 Fold the bottom edge of the romper up 1/4″ and then another 1/2″ and topstitch to hem. 26. Add your snaps and you’re done! Do you think I could make this into a shirt? I have enough fabric to make just the romper part without the sleeves or collar. I don’t want to use other fabric (it’s for my son’s baptism outfit) so it seems a little casual to use other fabric for sleeves/collar. I can’t buy more fabric. Do you think it would be too boxy to just cut it off around the waist? Can I use buttons on the crotch as I don’t have snaps or access to any? You could use buttons. You can also buy snap tape. It is like a ribbon that already has the snaps attached to it. Finished! I’m an experienced quilter, but new to patterns, so this was a challenge for me. Thank you SO much for the detailed instructions and color photos. I never would have made it through without. This is for my grandson, made from an upcycled shirt from his Grandpa. Turned out so cute! Thank you for the excellent pattern. 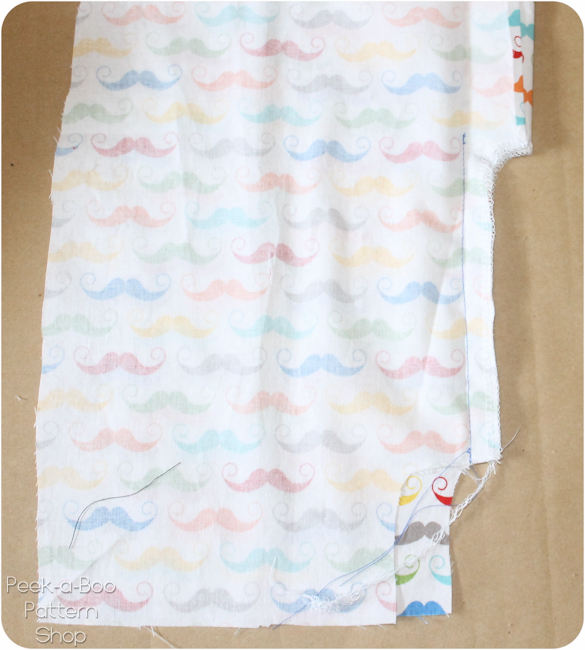 Is there a way to print the tutorial for the baby romper. 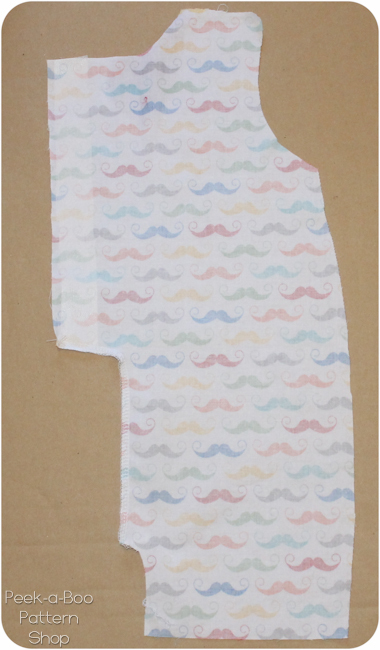 I have downloaded an printed the pattern. 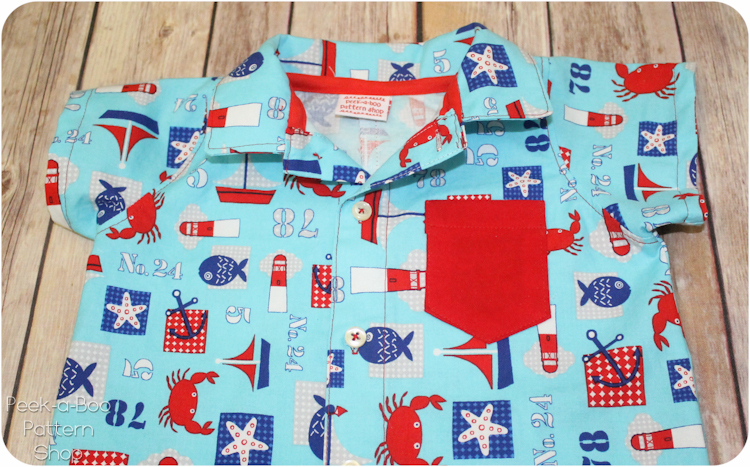 I bought this green anchor print fabric at my local fabric store and I am currently making one of these rompers for myself. I simply adjusted the zoom in my Adobe Reader to around 140% and traced the lines onto a piece of large craft paper for use at home. The print settings still showed the original pages but were cut off because the pattern went outside the “print area” so I simply traced it for my own personal use instead of goofing around with my printing. Some family is coming down and they have two girls who are about 10 and 15 and I figured that the youngest would still be playing outside at parks and on school playgrounds. With this in mind, I want to be dressed for these outside trips and I figured that a simple ons piece would do the trick for being outside with my family. What type of fabric did you use? Cotton or a knit? Could I ask what size snaps you used? I have a bunch of size 20 left over from my diaper making days and was thinking about using them if they weren’t too big.